I recently discovered that I am actually pretty good at making good food super fast. This dish for example, only took me 15 minutes to prepare, cook and plate up! It is also a great 4 Ingredients dish. It actually looked really good by the end of it, and tasted amazing for something so simple, and the flavours all worked together really well, so I decided no matter how little ingredients are involved or how simple it was, I will blog this. I am sure a lot of people out there can relate to not wanting to spend hours in the kitchen to come up with an impressive and decent meal. This dish is fulfilling, delicious and reasonably healthy so here goes! In a pot, bring water to boil. While waiting for water to boil, heat a frying pan, drizzle some olive oil and panfry salmon for approx. 4 minutes on each side. Meanwhile, add gnocchi to boiling water and let it cook until the water comes up to a boil again and gnocchi starts floating. Drain water, return gnocchi to heat and add spinach and olive oil. Toss for 2-3 minutes until spinach shrinks. Serve immediately with pieces of salmon. This is a new and exciting way for me to prepare salmon. I’m stuffing myself with a lot of fish for my EFAs and this looks very appealing! And it’s fast to make, with only 4 ingredients to deal with. I’ll treat myself with this dish in no time! Salmon dishes never fail to make my mouth water. I guess I’m such a big fan of salmon, that anything salmon is my kryptonite. And this one is very easy to make and healthy to boot! 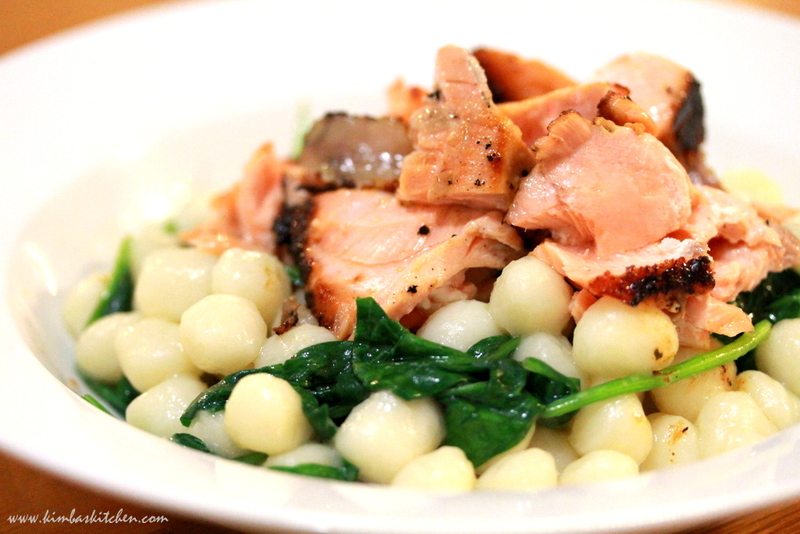 Thank you very much for sharing this salmon recipe.